Sen. Charles Grassley: Decisions "aren't going to be made real quickly"
(CNN) -- Two of the three Senate Republicans negotiating a bipartisan deal on health care reform said they consider an agreement out of reach before the Senate goes on its August recess. 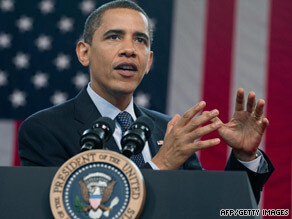 President Obama stresses the urgency of health care reform at a town hall meeting in Raleigh, North Carolina. That likely dashes the hopes of Democratic leaders and President Obama for a deal among the so-called Gang of Six negotiators that could deliver critical momentum for the stalled health care overhaul. The announcement was in contrast to some degree of progress made earlier in the day in the House. An agreement between four fiscally conservative House Democrats and the chamber's Democratic leadership allowed committee debate to resume on their version of the health care bill. However, the deal put off a vote by the full House on the president's top domestic priority until after the recess. Sen. Charles Grassley, R-Iowa, and Sen. Michael Enzi, R-Wyoming, dropped the bombshell Senate news to CNN and two other reporters in Capitol hallways Wednesday night. They have spent weeks behind closed doors, trying to hammer out an agreement with their Democratic counterparts on the Senate Finance Committee but said too many issues remain unresolved, making it almost impossible for them to sign on to a deal before the break. "There are a lot of tough decisions to make, and they aren't going to be made real quickly," Grassley said late Wednesday when asked whether negotiators should kick their talks over to September. Senate Majority Leader Harry Reid, D-Nevada, had already postponed Senate floor action on health care legislation until the fall, but Democrats had hoped the Senate Finance Committee could finish its work before the summer break. In fact, one senior Democratic source said meeting that deadline was the central thrust of the president's meeting with Reid and Finance Committee Chairman Max Baucus, D-Montana, last Friday. Grassley, the top Republican on the finance panel, briefed GOP senators on the state of the health care talks Wednesday. He said his colleagues want more time to consider the emerging legislation and want Republican negotiators to resist pressure from Democrats for an early agreement. "Most of our caucus feels that just simmering for people's reflections would be a good thing to do," he said. Enzi, who spoke while leaving the Capitol on Wednesday night, echoed Grassley's desire for more time before he'd agree to a deal. "We have huge parts that have not been discussed yet. We have other parts that we asked questions on that we haven't gotten answer back yet. I don't know how we make decisions on those parts -- they're pretty big issues," Enzi said. "You can't say you got to do it in a week, you got to do it in a month," he said. "You got to do it in the amount of time it takes." Enzi, a soft-spoken conservative, was furious about headlines Wednesday morning that suggested he was close to reaching a deal with the Democrats. "I felt my reputation was in danger," he said. Back at the U.S. House, Speaker Nancy Pelosi of California and House Majority Leader Steny Hoyer, of Maryland, announced that the Energy and Commerce Committee would begin debate on the health care bill and pass it by the end of the week. It is the last of three House committees required to pass the House version of the bill before it goes to the full chamber. The committee's version would be merged during the August break, which begins Friday, with versions passed by two other House panels, according to the statement from Pelosi and Hoyer. The final version would be debated by the full House when legislators return to Washington in September, the statement said. Obama and Democratic leaders had wanted both the House and Senate to approve bills before the break. The House deal with four of the so-called Blue Dogs, a group of fiscally conservative Democrats, was announced as Obama hit the road to build more public support for his health plan. In a statement issued by the White House before the Senate developments, Obama thanked members of the House and Senate, including "some Blue Dogs on the Energy and Commerce Committee," for "working so hard to find common ground." "Those efforts are extraordinarily constructive in strengthening this legislation and bringing down its cost," Obama said. Rep. Mike Ross of Arkansas and the Blue Dogs had threatened to derail the bill in the committee because of concerns that it costs too much and fails to address systemic problems in the nation's ailing health care industry. The Blue Dogs had presented committee Chairman Henry Waxman with a list of 10 items that they wanted changed in health care reform proposals. Neither side revealed what the 10 items were. Ross said the deal between four Blue Dogs on the House committee, the House Democratic leadership and the White House lowers the cost of the House health care reform plan by $100 billion and also exempts businesses with payrolls below $500,000 from having to provide health coverage for workers. He also said the bill's government-funded public insurance option -- a key provision for Obama and Democratic leaders -- would be a choice for consumers instead of coverage forced on people without health insurance. It was not immediately clear Wednesday whether any Blue Dogs beyond the four who made the agreement would sign on. The announcement by the Blue Dogs came as Obama held a town hall meeting on health care in Raleigh, North Carolina. Another town hall meeting took place later Wednesday in Virginia. If Congress fails to act soon, Obama warned the Raleigh audience, health costs will double over the next decade, make millions more Americans uninsured and bankrupt government on both the state and federal levels. He also brushed aside criticism that the plan is being rushed through Congress without adequate time for review and debate. At a second town hall meeting Wednesday -- near the produce aisle in a Kroger supermarket in rural Bristol, Virginia, on the border with Tennessee -- the president repeated assurances that his health care plan won't change Medicare benefits for senior citizens. But Sen Enzi insisted any deal he might ultimately sign onto would have to be preserved by Pelosi and Reid when it is merged with other more liberal legislation in the Senate and House. "I'm not interested in lending credibility to disaster," Enzi said. CNN's Dana Bash, Evan Glass, Deirdre Walsh and Ed Henry contributed to this report.